The St. Tammany Parish Library has an art collection at the Madisonville Branch. If you haven’t had the chance to view it and are an art lover, you may want to make a day trip to the branch in scenic Madisonville to check out your books and to view the collection of fine art on display there. 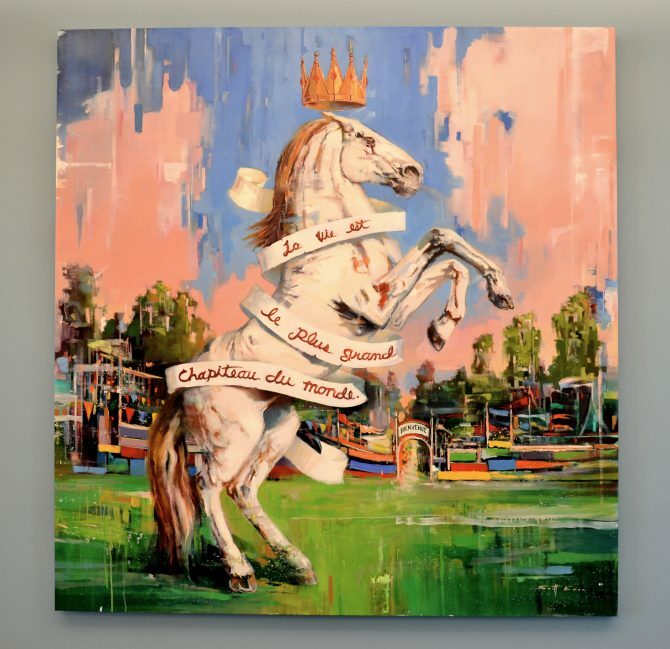 The new art collection is brightening the walls in various sections of the library with the flair and flavor of established local artists of St. Tammany Parish and New Orleans. Linda T. Dautreuil’s piece Writing Lesson is acrylic on canvas and is located at the entrance of the library. Her paintings have been exhibited in galleries and museums throughout the South, New York, the Southwest, Belgium, and France. 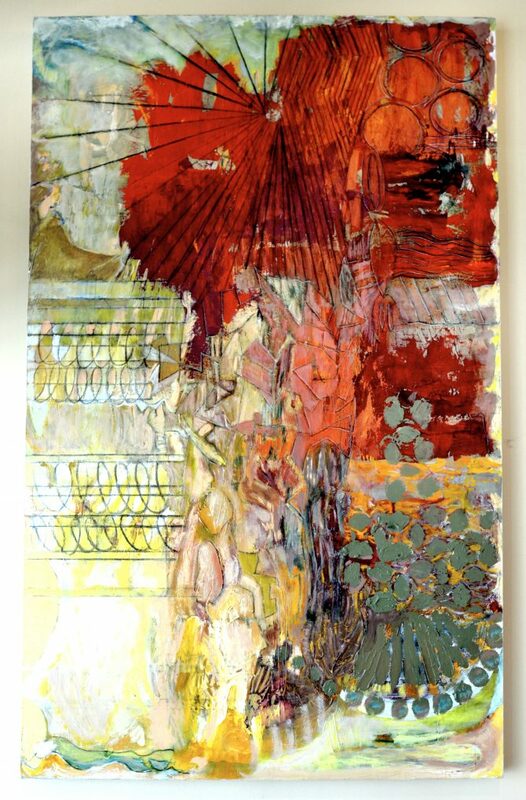 Her work is included in the permanent collections of the State of Louisiana Public Art Collection, The Hilliard University Art Museum (Lafayette), New Orleans Museum of Art and numerous private collections. Bonita Waesche’s work, Madisonville Marsh #18, is located in the Quiet Reading Room. Waesche has always been enchanted by powerful photographic images. After investing in professional photographic equipment, Waesche found herself, “Following light as it played across the waterscapes of Lake Pontchartrain or the petals of a perfect flower or the dignity of a human face for the power of light shapes the impact of an image.” Waesche feels privileged to live in St. Tammany Parish and enjoys so much natural beauty that inspires her work. Waesche lives in Mandeville. 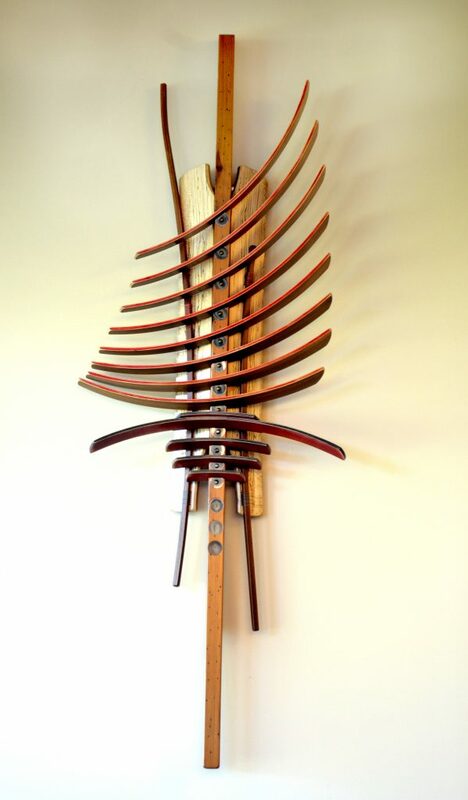 Rick Brunner’s Vibrations: E-Merge, comprised of different types of wood including walnut, spalted sycamore and sapele with pigment, is located in the Teen Area. “From a formal perspective, I don’t invent shapes as much as discover them. When these forms engage me, I appropriate and integrate them with my choice of materials, mostly woods, combining other materials whose intrinsic value fit my purpose. Often these shapes seem primitive yet comfortable, as though they come from dreams or a prior existence. Plant forms, insect shapes and their skeletal remains intrigue me. I believe nature to be the boldest of designers,” said Brunner. Brunner’s sculpture and furniture have been exhibited across the country in both regional and national art galleries and museums for the past 35 years. His work is included in major art collections both nationally and internationally. In 1997, he and his wife, an interior designer, opened Brunner Gallery in Covington, Louisiana. 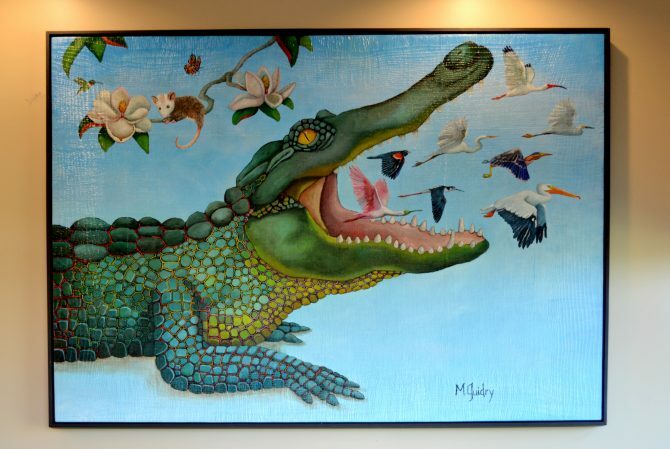 Michael Guidry’s Alligator, an oil on burlap and wood piece, is located in the Madisonville Branch’s alcove. Michael Guidry celebrates the splendor of the Coastal South with a sense of humor and honest simplicity. 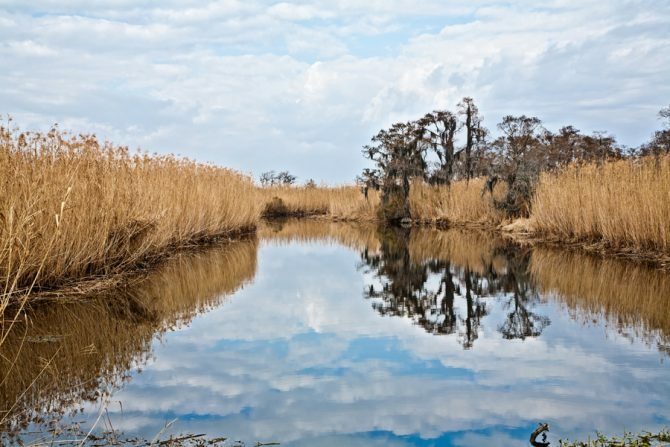 “I take inspiration from the fleeting beauty of personal experience and my time on the waters of Louisiana as a wayward explorer,” said Guidry. Guidry’s artwork is produced using traditional methods incorporating layers of oil paint on combinations of wood, burlap, canvas, and linen. He paints mostly in the studio working from life, memory, photographs, and his imagination. Beginning each painting as a traditional study, Guidry renders his subject faithfully in a monochromatic palette. He then puts away the reference material and begins the phase of the painting that he calls wishful thinking, where he adds and subtracts detail, and abstracts his lines and color. Guidry lives in New Orleans. This piece was commissioned for the Madisonville Library. Joel Blazek’s piece Medallions, is comprised of oak and maple and located in the public computer area. “Using different type of woods and surface treatments allows the viewer to view the whole work and at the same time to be able to find interesting individual elements within the individual pieces. The micro view of the piece is to focus the viewers’ attention to the unique designs that naturally occur in nature. The macro view is hopefully the viewer will look for those unique designs that are all around us in our natural environment,” said Blazek. Blazek is a woodturning artist and lives in Bush. He is represented by the Saladino Gallery in Covington. Scott Ewen’s Life is the Greatest Show on Earth is a piece made of oil on Linen and is located in the computer lab. “Life is the Greatest Show on Earth is a doorway into contemplating the crazy ride that is life. An invitation to the carnival, set against the trees of the marsh and bayou. As opposed to being one static statement, it’s intended to be an ebb of expectations, current moments and memories of yesterday that make up the peaks and valleys of our lives. Some happy and some sad, but always unique to each and every one of us,” said Ewen. Born in New Orleans, Ewen is a contemporary figurative and landscape painter combining attributes of realism and abstraction. He is also represented by the Saladino Gallery in Covington. Robert Warrens painting Communing with Nature: Sylvia Feeding the Dusky Gopher Frogs is acrylic on canvas and is located in the public computer area. “The Tchefuncte River and Lake Pontchartrain are a big part of everyone’s life in Madisonville and the perfect setting for family and friends. The idea of the paintings is to visualize, invigorate, and entertain, to act as a stimulus to get active and enjoy life,” said Warrens. Warrens is a professor emeritus of art at Louisiana State University. He lives in Mandeville with his wife Sylvia Schmidt. His work can be found in many important private and public collections and his paintings have been featured in shows at the Whitney Museum of Art in New York, the Chicago Art Institute, and the Corcoran Gallery of Art in Washington among others. This diptych was commissioned for the Madisonville Library collection. Warrens is represented by Sylvia Schmidt Fine Arts.